Photo from the William Evans Archives. Crew 40, left to right:- 1. Fl/Eng Frank Taylor; 2. W/OP F/Sgt Willie/Bill Evans; 3. Pilot F/O John/Jock Boyd; 4. R/AG W/O Bernie Compton; 5. Bomb Aimer Ken Hamilton; 6. MU/AG Sgt Ken Spriggs; 7. Nav John/Jock Mortimer. They were beside Halifax PN430 Z5-W "Willie", so the photo was probably taken mid/late April, or early May 1945 at Foulsham, as this aircraft was flown by this crew on their last 2 Ops. Crew 40, 462 Squadron, Driffield, Yorkshire, and Foulsham, Norfolk. It must have been interesting having 2 with the name Jock, and 2 with the name Ken, in the same crew. Links to Additional Crew Information; and Crew Ops. 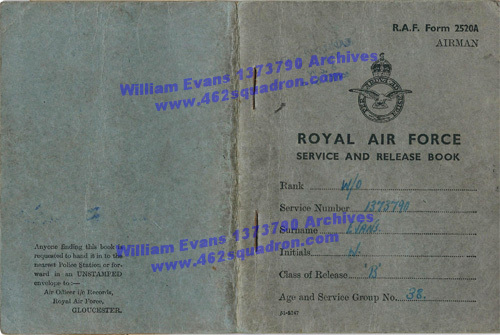 March 1946 RAF Service and Release Book for W/Op Evans. 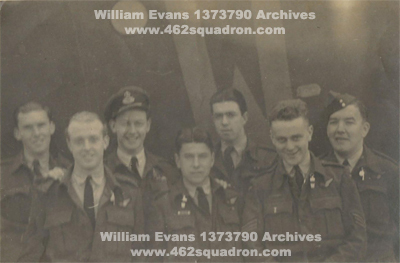 Photo snips of individual crew members were taken from original group photos at 462 Squadron, Driffield, and Foulsham (with thanks again to the original donors). 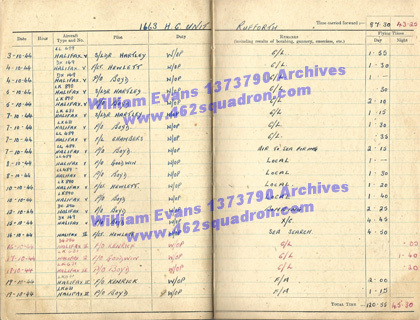 Reference sources – The National Archives of Australia (462 Squadron Operational Record Book). * From the website http://www.ab-ix.co.uk/rfc_raf.pdf which details RFC and RAF Service Numbers, and where and from when they were allocated. Thanks go to Michael and David EVANS, who forwarded scans of photos, log book, and various documents, and provided additional information from the Archives of the crew's Wireless Operator William EVANS (their father). Snipped from the photo of Pilots, Foulsham, March 1945. Original Group photo from the Australian War Memorial. 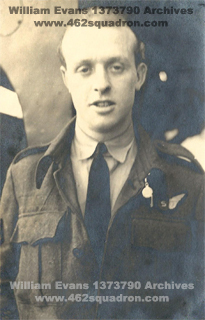 Boyd remained in the RAF after the war. He retired from the RAF in 1966. Snipped from the photo of Bomb Aimers, Foulsham, March 1945. Original Group photo from the RAAF Museum. Snipped from the photo of Navigators, Foulsham, March 1945. Original Group photo from the Aviation Heritage Museum of WA. Snipped from the photo of Flight Engineers, Driffield, November 1944. Original Group photo from the A A Newstead Collection. Snipped from the photo of "B" Flight Gunners, Foulsham, March 1945. Original Group photo from the M J Hibberd Collection. Sgt or F/Sergeant William Evans, showing his "Signals" brevet. The edges of his Sergeant's stripes are just visible on his sleeve. He was a Sgt at Driffield, but had been promoted to F/Sgt by mid-January at Foulsham. In the crew photo, his rank of F/Sgt was visible on his sleeve. from the William Evans Archives. 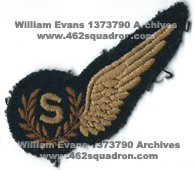 Signal's brevet as worn by W/Op Evans. It may be seen above his jacket pocket in his photos above. Warrant Officer cloth badges of rank, as worn by W/Op Evans, and taken from the lower section of his jacket sleeves (positioned as seen on the uniform of W/O Bernie Compton in his portrait above, right). 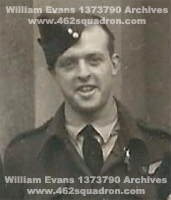 Evans was at the rank of F/Sgt when posted FROM 462 Squadron in May 1945, but was a Warrant Officer at demobilisation in March 1946. Document from the William Evans Archives. 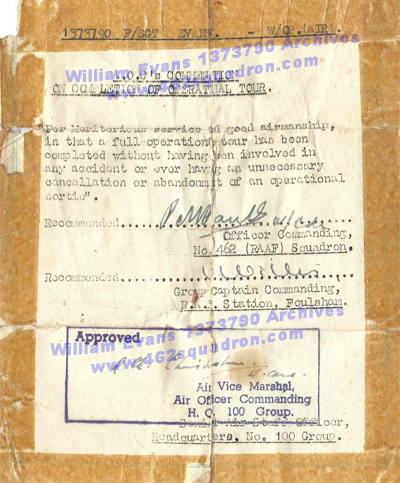 May 1945 – "Commendation on Completion of Operational Tour"
"For Meritorious service and good airmanship, in that a full operational tour has been completed without having been involved in any accident or ever having an unnecessary cancellation or abandonment of an operational sortie". Approved and signed by Air Commodore R A Chisholm, Air Vice Marshal & Air Officer Commanding HQ 100 Group. National Registration Identity Card, Number SLA 1686:005, issued to William EVANS, at demobilisation on 23 March 1946; stamped with Authorised Endorsement. His home address was Viewfield House, Mar Place, Sauchie, Alloa, Clackmannanshire, Scotland. 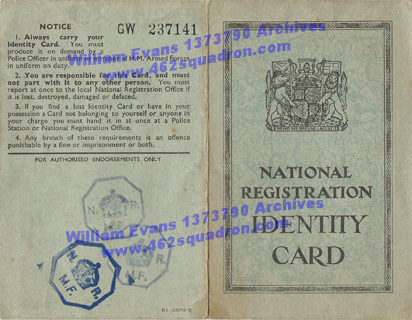 Inside of National Registration Identity Card, Number SLA 1686:005, Class Code 'A', issued to Williams Evans, stamped 23 March 1946, and signed by him; no changes of address. From the family of W/Op William Evans – the crew were all British, with Evans, Pilot Boyd, Nav Mortimer and Bomb Aimer Hamilton all from Scotland, although only Evans enlisted in Scotland. 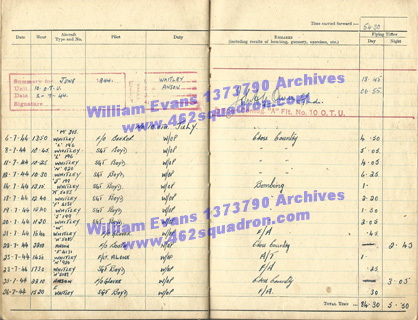 No RAF or RAFVR Service Files are available for any members of this crew, however some information has been extrapolated from W/Op Evans' documents, photos, and log book. Most of the information on Pilot Boyd was obtained from The London Gazette Archives. If you can assist with crew details, please make contact. June 1944 – 10 Operational Training Unit, Abingdon, Oxfordshire. From the log book of Evans, it is probable that the Boyd Crew had formed by late June 1944, during their posting to 10 OTU. Evans was flying as W/Op with a Sgt Boyd on 25th, 27th, and 30th June 1944, and was W/Op for Sgt Boyd during July and August 1944. October 1944 – 1663 Heavy Conversion Unit, Rufforth, Yorkshire. 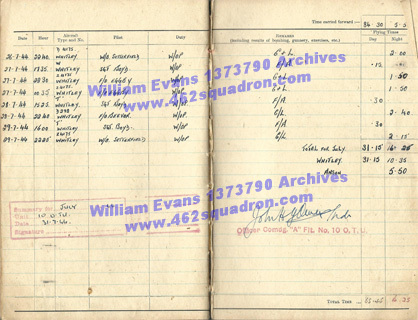 By early October 1944, Evans was regularly flying as W/OP for P/O Boyd at 1663 HCU. If the crew had formed at 10 OTU, they would have been posted together to 1663 HCU. The Flight Engineer would have joined the crew at this posting. November 1944 – 462 Squadron, Driffield, Yorkshire. The seven members of this crew were posted TO 462 Squadron in early November 1944, Boyd in the Officer's list (Form 540, page 29) and the other 6 in sequence in the NCO list of arrivals (Form 540, page 30). The crew's first familiarisation flight in a Halifax III was on 01 November 1944. The crew relocated with the Squadron in late December 1944 to Foulsham. January 1945 to May 1945 – 462 Squadron, Foulsham, Norfolk. 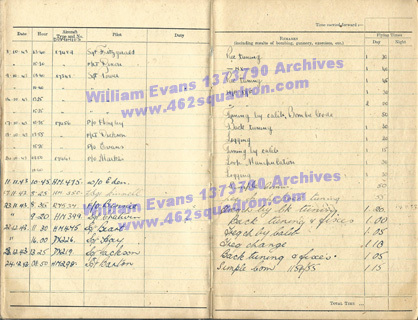 Details of this Crew's Ops at Driffield and Foulsham are in a later section, as are pages from the log book of W/OP Evans. 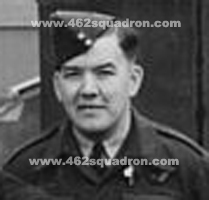 May 1945 – F/O Boyd was posted FROM the Squadron in May 1945 (Officer's list, Form 540, page 83); and F/Sgt Evans, F/Sgt Hamilton and F/Sgt Mortimer were also all posted FROM the Squadron in May 1945 (NCO list, Form 540, page 84). The postings FROM 462 Squadron of MU/AG Spriggs, R/AG Compton, and F/Eng Taylor, have not been located in the ORB, so their records may have been inadvertently omitted. May 1945 – 102 Squadron. 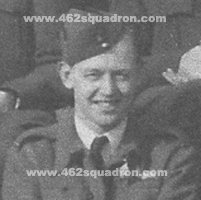 It is not known if the crew remained together after posting from 462 Squadron. 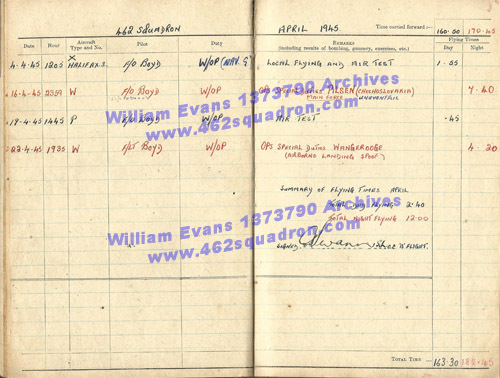 However in the log book of Evans, his next posting was TO 102 (Ceylon) Squadron, with his first local flight on the 31 May 1945, with Pilot F/O Boyd. All June and July 1945 flights, and 2 of 3 flights in August 1945 were with Pilot F/O Boyd, flying in Halifax aircraft. Flights in October 1945 were also with Pilot F/O Boyd, flying in Liberator aircraft. February 1946 – 53 Squadron. Boyd and Evans had parted ways by February 1946. During this month, Evans was flying as W/OP for Pilot F/Lt Penfold, in 53 Squadron. Boyd enlisted in the RAFVR, sometime after April 1941, at Padgate, and was allocated the Service Number 1522876 (in a sequence of service numbers issued at Padgate from April 1941). Details are not yet known of his early training and postings. By June 1944, he was at the rank of Sergeant at 10 OTU. 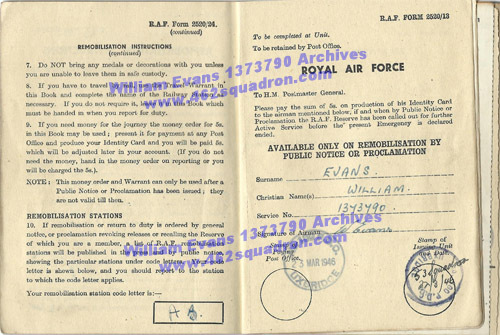 05 August 1944 – RAFVR, General Duties Branch, Appointment to Commission, as Pilot Officer, from the rank of Sergeant, 1522876, and issued with new Officer Service Number 182590. London Gazette Number 36716, page 4432, dated Tuesday 26 September 1944 (2nd Supplement to Issue of Friday 22 September 1944). This change in rank from Sergeant to Pilot Officer matches Pilot Boyd's details in Evans's log book for June, July, August, and October 1944. 05 February 1945 – RAFVR, General Duties Branch, confirmation of Pilot Officer, and promotion to Flying Officer, J N B BOYD, 182590. London Gazette Number 36985, page 1440, dated Friday 16 March 1945 (3rd Supplement to Issue of Tuesday 13 March 1945). This promotion may have been advised in advance, as Boyd was listed in the ORB Ops with rank of F/O from 21 January 1945 onwards. 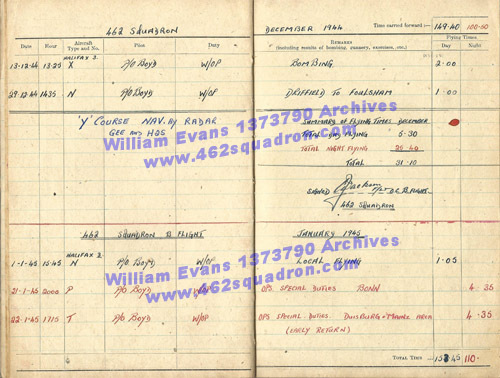 May 1945 to end of October 1945 – 102 (Ceylon) Squadron (as extracted from Evans's Log Book). His subsequent postings have not yet been identified, but from the following, it is clear that he remained in the RAF, with several promotions. 15 May 1947 – RAF, General Duties Branch, Appointment to Commission, as Flying Officer, extended service (four years on the active list), Service Number 182590, seniority 5 August 1945* (*retaining existing rank under war-time rules subject to provisions of A.M.O. A.897/47.). London Gazette Number 38153, page 6084, dated Tuesday 23 December 1947 (2nd Supplement to Issue of Friday 19 December 1947). 01 November 1947 – RAFVR, General Duties Branch, Granted the substantive rank of Flying Officer, 1 November 1947, with the seniority stated, 182590, seniority 5th August 1945. London Gazette Number 38169, page 144, dated Tuesday 06 January 1948 (2nd Supplement to Issue of Friday 02 January 1948). 05 February 1948 – RAF, General Duties Branch, Promotion from Flying Officer to Flight Lieutenant, 182590. London Gazette Number 38231, page 1744, dated Tuesday 09 March 1948 (4th Supplement to Issue of Friday 05 March 1948). 23 November 1948 – RAF, General Duties Branch, Appointment ito Commission as Flight Lieutenant (permanent), 182590. London Gazette Number 38593, page 2034, dated Tuesday 26 April 1949 (Supplement to Issue of Friday 22 April 1949). 01 October 1955 – RAF, General Duties Branch, Promotion from Flight Lieutenant to Squadron Leader, 182590. London Gazette Number 40595, page 5477, dated Friday 30 September 1955 (Supplement to Issue of Tuesday 27 September 1955). 17 May 1956 – The Age Newspaper, Melbourne, page 1, picture shown there of (from left to right) Pilot, Squadron Leader J N B Boyd of Scotland; Navigator Flying Officer J M Love of London; and Group Captain S W Menaul, Commander of the RAF Atomic Task Force at RAAF Station, Pearce; following the explosion of an atomic "device" at Monte Bello Island the previous day (with adjacent article in the newspaper, not re-produced here due to Copyright). 01 January 1957 – Air Ministry, The QUEEN has been graciously pleased to approve the following award:- Air Force Cross, to Squadron Leader John Nelson Bryson BOYD (182590), Royal Air Force. London Gazette Number 40960, page 36, dated Tuesday 01 January 1957 (Supplement to Issue of Friday 28 December 1956). 02 February 1957 – The Age Newspaper, Melbourne, page 1, mentions the replacement of Sqn Ldr J N B Boyd as Commander of 76 Squadron; and that Sqn Ldr Boyd flew through two atomic clouds to obtain samples for scientists during the trials in Australia; and that he was awarded the Air Force Cross in the New Year's Honours List (article not re-produced here due to Copyright). February 1960 – Sqn Ldr J N B Boyd, AFC, Listed as a Commanding Officer of 6 Squadron RAF during February 1960 (reference from 6 Squadron RAF Association website). 04 August 1966 – RAF, General Duties Branch, Retirement, Squadron Leader J N B Boyd, AFC 182590. London Gazette Number 44077, page 8829, dated Tuesday 09 August 1966 (2nd Supplement to Issue of Friday 05 August 1966). From the Evans family, it is thought that Boyd may have later emigrated to Australia to fly for Qantas. Bomb Aimer K E HAMILTON 1322547 – also listed on Ops with the incorrect Service Numbers 1322457, 13222547, and 13252547. However he was the only Hamilton in the Squadron, so this was not an identification problem. 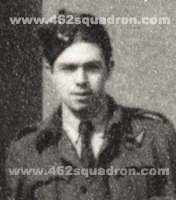 Navigator John MORTIMER 1423760 – also listed on Ops with the incorrect Service Numbers 423760, 14237610, and 1423780 (but was the only Mortimer in the Squadron). Flight Engineer F C TAYLOR 1804309 – also listed on Ops with the incorrect Service Numbers 1804308 and initials F O, F V and F C, and also as S E (S E Taylor was SD/W/OP so could not have filled in for F/Eng duties). There were SIX men with the surname Taylor in 462 Squadron, so this created some minor identification problems – five were RAAF – one Pilot, three W/OPs (two of whom also carried out SD/WINDOW Ops), one Navigator; but only one RAF/VR Flight Engineer, of the Boyd Crew. Mid-Upper Gunner Kenneth SPRIGGS 1869863 – also listed on Ops with the incorrect Service Numbers 1669863 and 18691863 (but was the only Spriggs in the Squadron). Very early in this website's construction, Ken Spriggs supplied many documents via his 3rd-cousin. However at that stage, he did not want any publicity, or a web page constructed. He also identified himself and R/AG Bernie Compton in the photo of Air Gunners of "B" Flight, at Foulsham. The information received from him was of great assistance in further research. Sadly, as he was unwell at the time, I was unable to meet him during my travels in the UK during 2012. Ken passed away peacefully at his home on 20 January 2016. He had one daughter. There is a lovely photo of him with his Funeral Notice in the Coventry Telegraph of 08 February 2016 (not re-produced here due to Copyright). Rear Gunner B COMPTON 1850671 – also listed on Ops with the incorrect Service Numbers 1850771, 1850760 and 9850671, and also with the initial D (but was the only Compton in the Squadron). 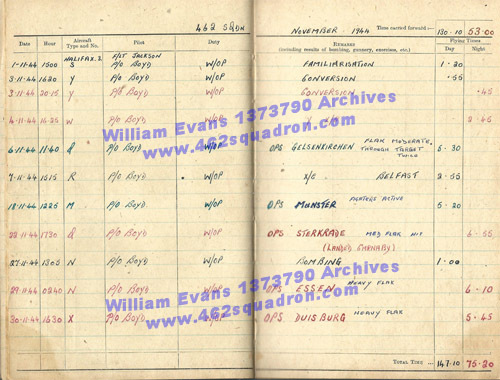 Wireless Operator William EVANS 1373790 – also listed on Ops with the incorrect Service Numbers 13733790, 137790, and 1373700. He was also once named W W Evans. There were 5 air crew with the surname Evans in 462 Squadron – a Pilot, a Bomb Aimer, a Navigator (all RAAF) and 2 Wireless Operators, both RAF/VR, but identification of each was possible, even with ORB errors. 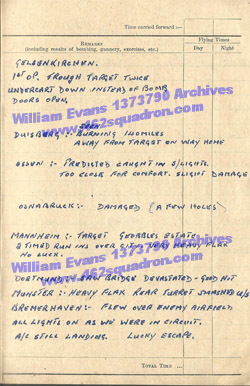 The following information has been summarised from scans of his RAF Log Book, his RAF Service and Release Book, and various documents received from his family. 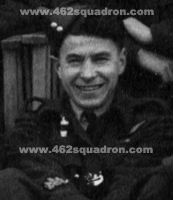 22 June 1941 – Enlisted in the RAF at Edinburgh, Scotland. 04 October 1943 – Night Vision test, and training commenced at 4 Radio School (4 RS), Madley, Herefordshire; flying in Dominie aircraft. 04 February 1944 – Qualified as Wireless Operator at 4 RS Madley. 12 May 1944 – Attended Wireless Operator Air Gunner (WOAG) Course held at 1 (Observers) Advanced Flying Unit (1 (O) AFU), Wigtown, Dumfries and Galloway, Scotland; training in Proctor and Anson aircraft. 5 June 1944 – Passed Course with notation that "Extra synthetic training given"; signed by Chief Instructor E C Roberts. June 1944 – Posted to 10 Operational Training Unit (10 OTU), Abingdon, Oxfordshire; flying in Whitley and Anson aircraft; this was probably where the Boyd crew formed. 07 July 1944 – Night Vision Training at 10 OTU. July, August 1944 – 10 OTU; Log Book signed off 18 August 1944 at completion of training. October 1944 – Posted to 1663 Heavy Conversion Unit (1663 HCU), Rufforth, Yorkshire; flying in Halifax V and II aircraft. November 1944 – posted to 462 Squadron, Driffield, 4 Group, flying in Halifax III aircraft. 29 December 1944 – relocated with 462 Squadron to Foulsham, Norfolk, 100 Group. January to May 1945 – 462 Squadron, Foulsham. 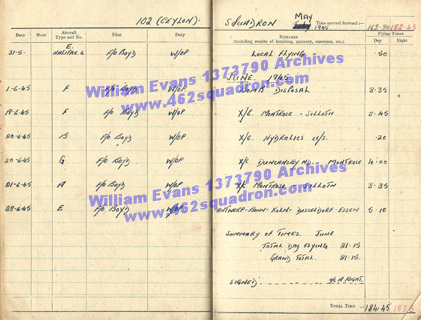 May 1945 – Log Book signed off as "1st Tour Completed". "Commendation on Completion of Operational Tour" recommended and signed by Wing Commander P M Paull, Officer Commanding 462 Squadron; and Group Captain C V D Willis, Officer Commanding RAF Station Foulsham; and approved and signed by Air Commodore R A Chisholm, Air Vice Marshal & Air Officer Commanding HQ 100 Group. A scan of the original Commendation, and its transcription, may be seen in an earlier section, with photos of Evans. Op of 22 Jan 1945 – Returned early. Special Equipment U/S – The Commendation for Evans at the completion of his Operational Tour, stated "without ever having an unnecessary cancellation or abandonment of an operational sortie" – so the Op of 22 January must have been classed as a "necessary" abandonment. May 1945 – Posted to 102 (Ceylon) Squadron, Transport Command; based at Pocklington, Yorkshire, flying in Halifax VI aircraft; May, June, July, August 1945 – flying with Pilot F/O Boyd (in September 1945, 102 Squadron relocated to RAF Bassingbourn, Cambridgeshire and re-equipped with Consolidated Liberator aircraft). October 1945 – flying at at 102 Squadron, Bassingbourn, flying in Liberator aircraft, with Pilot F/O Boyd. February 1946 – Posted to 53 Squadron, Transport Command, flying in Liberator aircraft with pilot F/Lt Penfold. In this month, Evans was W/Op for a week-long flight from his UK Base via Libya, Egypt, and Iraq, to final destination India; returning via Iraq, Palestine, Libya, southern France, and thence back to UK Base. It is assumed they were transporting troops and/or ex-prisoner-of-war from India to the UK. (scan of Book in later section). 23 March 1946 – National Registration Identity Card GW237141 issued; with Number SLA 1686:005, for his home address at Viewfield House, Mar Place, Sauchie, Alloa, Clackmannanshire, Scotland (card shown in previous section with photos). 1964 – William Evans and his family emigrated from Scotland to New Zealand, after William applied for a management position at Holeproof Mills. It is impressive that his Commendation, Log Book, Release Book, National Registration Identity Card, photos, badges and other documents have survived for over 72 years, and that they were considered important enough to take to the other side of the world. The Commendation in particular has been handled often, and now shows some wear. 2013 – William Evans died aged 91. Pilot Boyd, total 26 personal Ops; his 1st Op was on 02 November 1944 as 2nd Pilot for Pilot Hickey and Crew 9, followed by a further 25 Ops with his usual crew, with some substitutions. 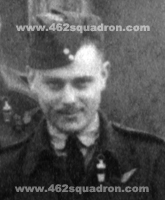 Bomb Aimer Hamilton 27 Ops – 25 with Boyd as B/Aimer; plus 1 each with Marchant and Ely as SD/WINDOW dispenser. Nav Mortimer 26 Ops – 24 with Boyd as Nav: plus 1 with Smith as Nav, and 1 with Jackson as Bomb Aimer (? possible error). W/Op Evans 24 Ops – 23 with Boyd as W/OP, plus 1 with Anderson as W/OP. MU/AG Spriggs 25 Ops – 24 with Boyd as MU/AG, plus 1 with with Hancock as SD/WINDOW dispenser. R/AG Compton 24 Ops – 24 with Boyd. F/Eng Taylor 25 Ops – 24 with Boyd, plus 1 with Ridgewell as SD/WINDOW dispenser. Navigator – Philip Arthur KELLY x 1 (usually Nav in the Byrom crew). Wireless Operator – Alexander Gordon TAYLOR x 1, and Leslie John POWER x 1; (A G Taylor served in many crews in the roles of W/AG, W/OP or SDW; Power was usually W/OP in the Cookson crew). Rear Gunner – Fred SATHERLEY x 1 (usually R/AG in the Anderson Crew). Mid-Upper Gunner – Astley GORDON x 1 (usually MU/AG in the Anderson Crew). Flight Engineer – A A Newstead x 1 (usually F/Eng in the Anderson Crew). Special Duties, WINDOW Dispenser – on 13 Ops. James Fergus LATIMER x 6 Ops; one Op each for F T HUTTON; Fred SATHERLEY; Harold William CALMAN; John Francis WALL; Garth FINK; Stanley Ernest TILLS; Llewellyn George EDWARDS. Latimer was previously the Bomb Aimer for the Mitchell crew, but was left without a crew when he was substituted on 02 November 1944 and his crew failed to return from that Op; Hutton usually MU/AG for Uther crew; Satherley usually R/AG for Anderson crew; Calman usually R/AG for James crew; Edwards usually W/Op for Whatling crew; Wall and Fink and Tills were all W/OPs posted TO the Squadron for WINDOW duties. Leonard James FLETCHER x 2 Ops; P SAWATZKY x 3 Ops (1 listed as WINDOW but probably RCM). 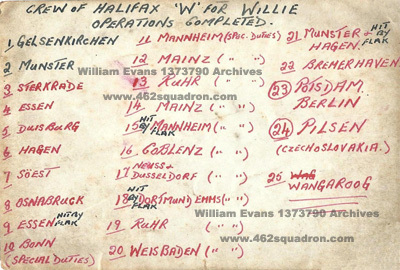 Above is a list of Ops for Crew 40, as recorded by W/OP Evans on the reverse of the crew photo. It excludes the Pilot's 1st Op as a 2nd Pilot , so aligns with Ops 2 to 26 in the following table. Special Duties Ops were from early January 1945, at Foulsham. Black was for day flights, and red for night flights. Some target names vary from those as recorded in the ORB, with "Ruhr" covering a range of targets in that area. Aircraft Code Numbers Z5- are thought to be correct. However, there are discrepancies within the ORB, and between the ORB and various authors. Except for 2 Ops, the Aircraft Code Numbers listed in the W/Ops log book match those listed below. 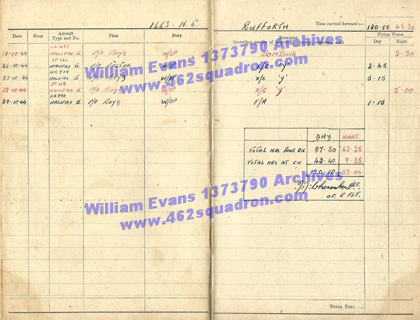 Note that additional information in italics in Comments column is from the Log Book of W/Op Evans. Times up and down in black are day flights, and times in red are night flights. Target "Düsseldorf x 15" means 15 aircraft tasked from 462 Squadron to the target of Düsseldorf, with Boyd's crew being one of those 15 (and so on for the other dates). Target "Koblenz x 9 (of 12)" means this crew was one of 9 aircraft from 462 Squadron tasked to the target of Koblenz, with 3 other aircraft of this Squadron tasked to a different target. There is some variation in the spelling of Target names in the original ORB. MF Main Force; PP Protective Patrol; (for Radio Counter Measures (RCM) using RCM Special Equipment). Flak moderate, through target twice, undercart down instead of bomb doors open. 21/11/1944 4 NA619 Q 1729 0025 Sterkrade x 15 B Landed away at Carnaby due to bad visibility at Foulsham on return. 22/01/1945 13 PN168 T 1713 2131 Ruhr x 11 SD SP W Returned early. Special Equipment U/S. in Log book as W.
Photos of MZ341/P; MZ431/J: MZ913/N; PN168/T; LW440/B; MZ306/K; NA148/Z; MZ467/C are on the Halifax page. MZ467 Z5-C was lost on the night of 16/17 April 1945, Lodder and Crew 44. MZ469 Z5-N was lost on the night of 06/07 January 1945, Rohrlach and Crew 48. The Log Book front cover, and pages which covered entries during training, have been reduced in size to fit two views across the screen. This also applies for later postings which occurred after Evans was posted FROM 462 Squadron, i.e. 102 Squadron and 54 Squadron. The pages which covered 462 Squadron Ops and other flying, are slightly larger with one view across the screen. Above:- Front cover of Log Book. 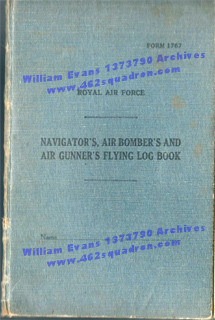 Form 1767, Royal Air Force, Navigator's, Air Bomber's and Air Gunner's Flying Log Book (used by Wireless Operator / Air Gunner William Evans 1373790, who didn't get to write his name on it). Left – Instructions for use; Right – Certificates of Qualifications. 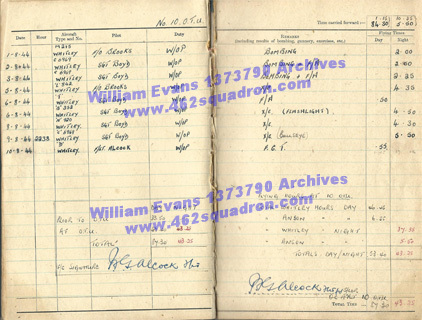 Evans qualified as Wireless Operator Aircrew on 04 February 1944, at 4 Radio School, Madley. On the lower edge is Night Vision 15/32 dated 04 October 1943, also at 4 RS. 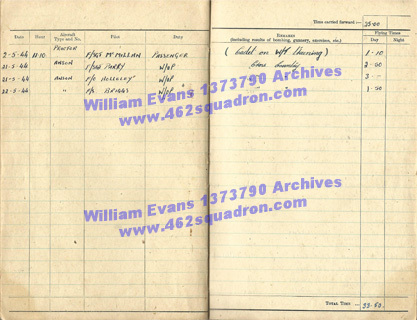 Above:- Log Book, 08 October to 24 December 1943, at 4 RS, Madley. 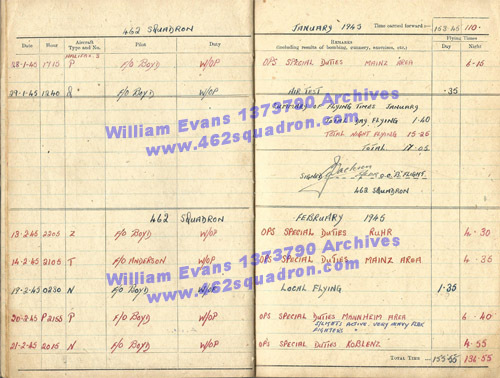 Above:- Log Book, at 4 RS, signed by P/O Wilson, Officer in Charge, Air Operating Section, 4 Radio School, Madley. Total flying hours – 25h; with 16 hours 20m in Multi Engine aircraft (Oct) and 8 Hours 40m in Single Engine aircraft (Nov/Dec). October 1943 – Dominie aircraft. November/December 1943 – Serial numbers only, aircraft not named (identified as Proctor III – HM and DX series serial numbers*). Training included – Receiver tuning, tuning by calibration, back tuning and fixes, logging, frequency changes, simple communication. Above:- May 1944. Although the page was not marked by location, the details match those in the certificate (at right) – WOAG Course at 1(O)AFU, Wigtown, Dumfries and Galloway, Scotland. Flights – passenger in Proctor; and as W/OP in cross country flights in Ansons. 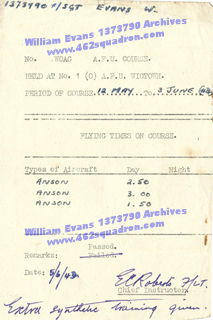 Above:- Record of attendance at WOAG Course held at 1(O)AFU, Wigtown, from 12 May to 03 June 1944. 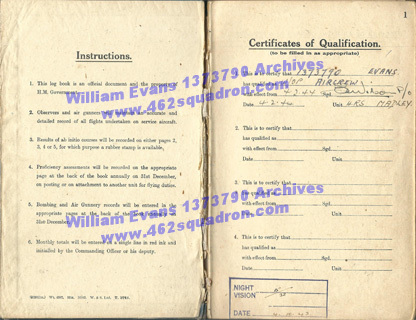 Evans 'Passed' the course on 5 June 1944, signed by Chief Instructor FLt E C Roberts. 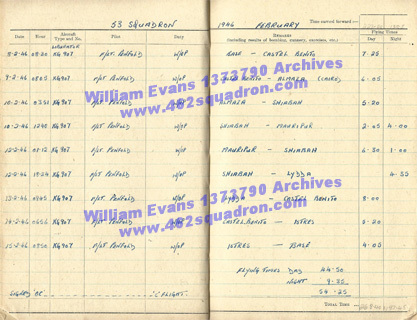 Above:- Log Book, at 10 OTU, commencing flights on 23 June 1944, training as W/OP in Whitley and Anson aircraft; cross country flights, and circuits and landings; day flights, some with Pilot Sgt Boyd. Above:- Certificate of Night Vision Training, Exercise No. 1 on 07 July 44, at 10 OTU, Abingdon. Above:- Log Book, at 10 OTU, Signature of Officer Commanding "A" Flight for June; training flights for July 1944 in Whitley and Anson aircraft; cross country, bombing, F/A (fighter affiliation), A/T (Air Tests), day and night flights, most with Pilot Sgt Boyd. Above:- Log Book, at 10 OTU, July 1944, Whitley aircraft; C&L (circuits and landings) F/A (fighter affiliation); with Signature of Officer Commanding "A" Flight for July. 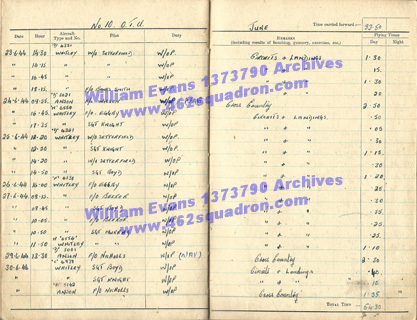 Above:- Log Book, at 10 OTU Abingdon, August 1944; Whitley aircraft; mostly with Pilot Sgt Boyd; bombing, F/A (fighter affiliation); X/C (cross country), F.C.T. (abbreviation for ? ); note "Flashlight" comment on 06 August, and "Bullseye" on 09 August (both night flights); Signature of Officer Commanding "A" Flight for August 1944. 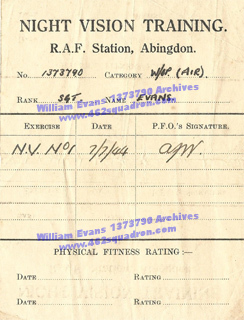 Above:- Log Book, at 10 OTU, 18 August 1944, Signature of Officer Commanding Training Wing, RAF Station, Abingdon; indicating that Evans had completed training at 10 OTU. Above:- Log Book, at 1663 HCU Rufforth, from 03 October 1944; Halifax V and Halifax II; 50% of flights with Pilot Sgt Boyd; C/L (circuits and landings), air to sea firing, local flights, bombing, X/C (cross country), sea search, F/A (fighter affiliation). day and night flights, with night entries now recorded in red. Above:- Log Book, at 1663 HCU Rufforth, for late October 1944; Halifax II; bombing, F/A (fighter affiliation), X/C 'Y" (cross country, 'Y' Course using navigation by Radar GEE and H2S – see notes on December 1944 page of Log Book); day and night flights; with Signature of Officer Commanding 'C' Flight, HCU training completed. and 462 Squadron, Foulsham, 100 Group, January to April 1945, Special Duties (WINDOW Spoofs) and Special Duties (Radio Counter Measures). Please refer to the table in the previous section for summary of Ops, aircraft Serial Numbers, crew member substitutions, any ORB comments, and names of 8th and 9th crew member for duties as WINDOW dispensers, or to operate Special equipment for RCM. Above:- 462 Squadron, Driffield, November 1944; Halifax III; Pilot P/O Boyd; familiarisation and conversion (with aircraft and local conditions), X/C Y (cross country, 'Y' using navigation by Radar GEE and H2S), bombing, one cross country to Belfast; all Bombing Ops; day and night flights; note comments regarding flak, through target twice, fighters; and landing away at Carnaby at 25m past midnight, after being hit by flak (log dated as 22 November, but in ORB as night of 21 November, crew may have returned to Driffield later on the 22 November). Above:- 462 Squadron, Driffield, Sign-off for November Summary of Flying Times, signature of F/Lt C W Jackson, as Officer Commanding 'B' Flight, 462 Squadron. December 1944; Halifax III; Pilot P/O Boyd; night Ops, with flak and s/lights comments; daytime F/A (fighter affiliation), and blind bombing training. 29 December 1944, in Halifax Z5-N in Air Party for permanent relocation with the Squadron from Driffield to Foulsham. Sign-off for December Summary of Flying Times, signature of F/Lt C W Jackson, as Officer Commanding 'B' Flight, 462 Squadron. 462 Squadron, Foulsham, Log Book, January 1945; Halifax III; day flight for bombing training; night Ops, one with early return. Sign-off for January Summary of Flying Times, signature of F/Lt C W Jackson, as Officer Commanding 'B' Flight, 462 Squadron. 462 Squadron, Foulsham, Log Book, February 1945; Halifax III; night Ops with flak, s/lights and fighters; day flight for local flying. 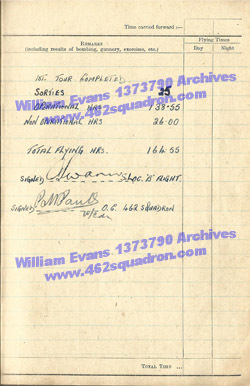 Above:- 462 Squadron, Foulsham, Log Book, February 1945; Halifax III; Pilot F/O Boyd; night Op, day flights for air tests and air to sea firing; Sign-off for February Summary of Flying Times, signature of S/Ldr A G Swann, as Officer Commanding 'B' Flight, 462 Squadron. 462 Squadron, Foulsham, Log Book, March 1945; Halifax III; Pilot F/O Boyd; night Ops, one with heavy flak. Sign-off for March Summary of Flying Times, signature of F/O J N B Boyd, for Officer Commanding 'B' Flight, (and Pilot of crew). Sign-off for April Summary of Flying Times, signature of S/Ldr A G Swann, as Officer Commanding 'B' Flight, 462 Squadron. Above:- Sign-off at Foulsham, May 1945, First Tour Completed. Signature of S/Ldr A G Swann, as Officer Commanding 'B' Flight, and W/Cdr P M Paull, Officer Commanding 462 Squadron. Above:- Notes regarding various Ops undertaken at Driffield and Foulsham – these comments have been added to the relevant entry in the Crew Ops Table as shown in the previous section. 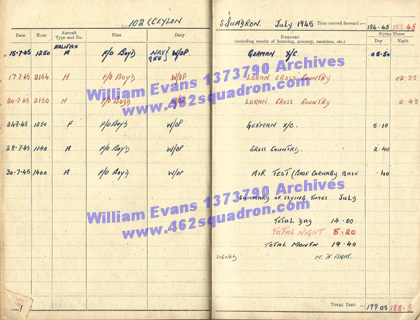 Above:- Log Book, 102 Squadron, 'A' Flight, Pocklington, May and June 1945, Halifax VI, Pilot F/O Boyd; day flights. May was local flying; June flights were for bomb disposal; two X/C (cross country) – Montrose – Silloth; one short X/C due to Hydraulics being U/S (unserviceable); X/C (cross country) – Duncansby Head – Montrose; German flight over Antwerp, Bonn, Köln (Cologne), Düsseldorf, Essen. June Summary not signed. (Montrose, Duncansby Head & Kinloss – Scotland; Silloth – Cumbria). 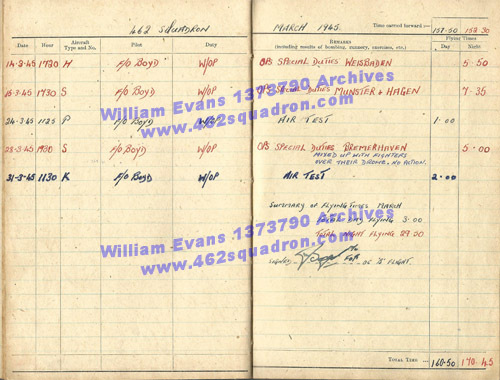 Above:- Log Book, 102 Squadron, 'A' Flight, Pocklington, July 1945, Halifax, Pilot F/O Boyd. Day flights – 2 x German Cross country, local cross country; Air Test from base to Carnaby to Base. Night flights – 2 x Loran cross country (Loran = long range navigational aid – British Radar). July Summary not signed. June and July German flights were 5h 10m and 5h 50m, and at 462 Squadron were referred to as "Cook's Tours" to view bomb damage. 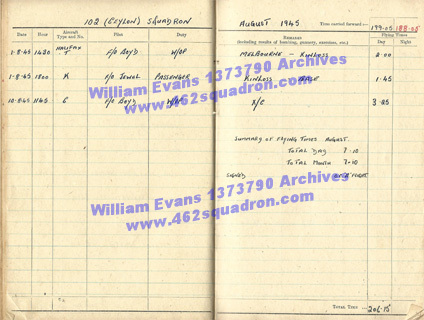 Above:- Log Book, 102 Squadron, 'A' Flight, Pocklington, August 1945, Halifax, mostly Pilot F/O Boyd. Day flights – Base to Melbourne (Derbyshire) to Kinloss (Scotland) as W/OP; Returned from Kinloss to Base as passenger; cross country. 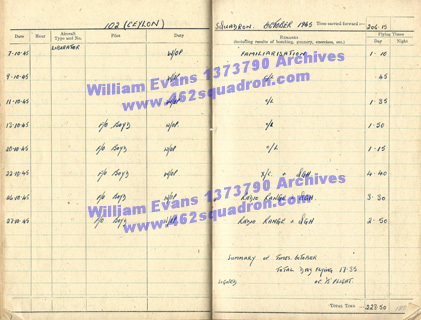 Above:- Log Book, 102 Squadron, 'B' Flight, Bassingbourn, October 1945, Liberator aircraft, Pilot F/O Boyd. Day flights for familiarisation, Circuits and landings, cross country, QGH ( = ? ); radio range & QGH. October Summary not signed. 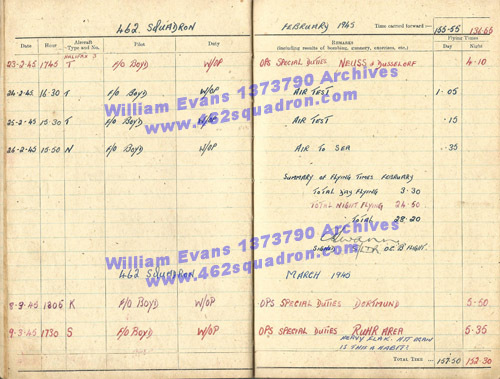 Above:- Log Book, 53 Squadron, 'C' Flight, February 1946, Liberator aircraft, Pilot F/Lt Penfold. Summary not signed. Sharp carried out a similar flight in May 1946, with photos at Shiabah, India and southern France. 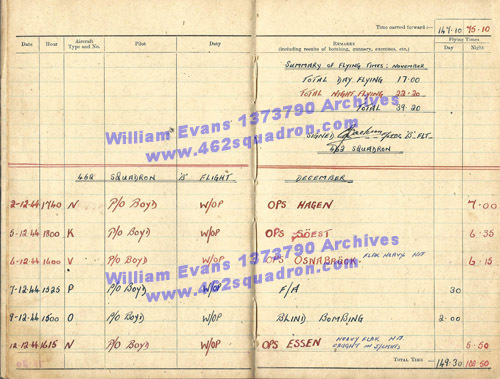 William Evans 1373790 RAF, 462 Squadron – Log Book, aircraft in which flown. 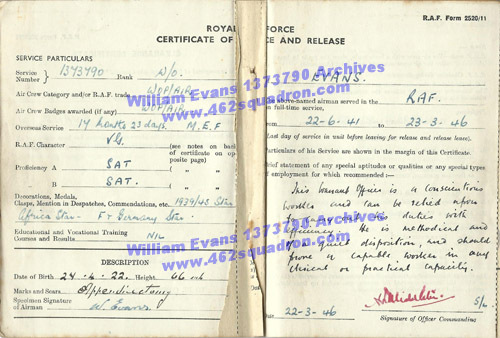 Above:- RAF Form 2520A for Airman, Warrant Officer W Evans 1373790. Class of Release – 'B'. Age and Service Group 38 – as Evans was not yet 24 years old, this must be his Service Group Number. Above:- Instructions in the case of Remobilisation should it be necessary, authorising payment of 5s. to the airman, on presentation of his Identity Card, to cover cost of rail travel to Remobilisation Station, Code A. 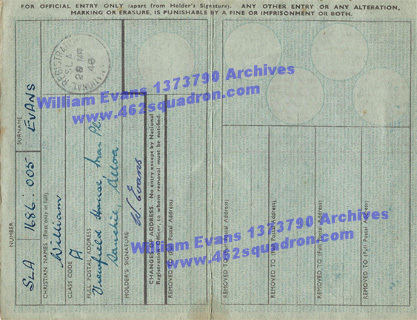 Completed and stamped by Issuing Unit, 53 Squadron, 22 March 1946; stamped by 100 PDC (Personnel Dispersal Centre), Uxbridge, 23 March 1946. 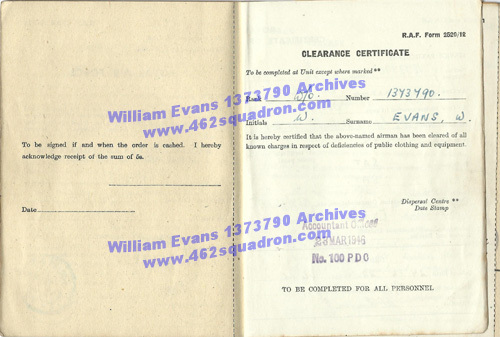 Above:- Clearance Certificate, dated 23 March 1946, issued by Accountant Office, 100 PDC, which certified that the named airman had been cleared of all known charges in respect of deficiencies of public clothing and equipment. Recommendation "This Warrant Officer is a conscientious worker and can be relied upon to carry out his duties with efficiency. He is methodical and of a quiet disposition, and should prove a capable worker in any clerical or practical capacity." Dated 22 March 1945, and signed by S/Ldr A L Middleton(? ), Officer Commanding (presumably OC 53 Squadron, his last Service Unit). 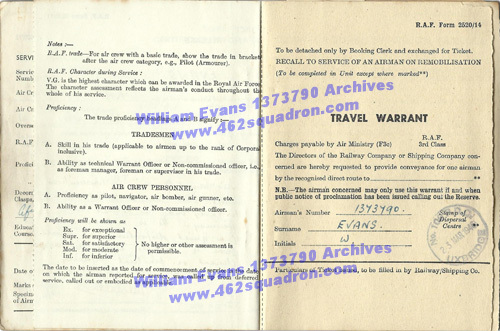 Right – Travel Warrant, for 3rd Class Rail Travel, in the case of "Recall to Service of an Airman on Remobilisation"; to be detached only by Booking Clerk and exchanged for Ticket. Stamped at 100 PDC, Uxbridge on 23 March 1946. Above:- Instructions for Medical Treatment after leaving Dispersal Centre – entitlement to medical benefit under the National Health Insurance Acts. 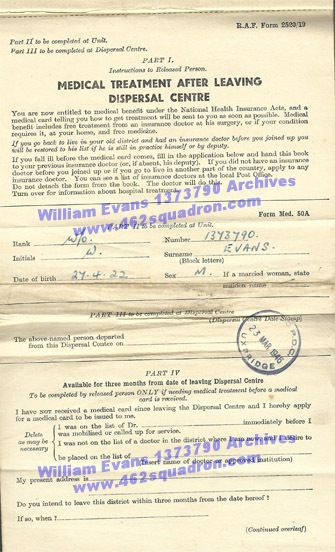 A medical card was to be forwarded to the named airman, advising on how to obtain free treatment, and free medicine should it be required. The Form was only to be detached by the Insurance Doctor. Information about hospital treatment was on the reverse. Stamped on 23 March 1946 at 100 PDC, Uxbridge.